Choreographer Peggy Piacenza’s new work, “The Event,” is an evening of contemporary dance, short film and song tackling the meaning of life, the inevitability of death, and how we experience everything in between. Choreographer Peggy Piacenza’s new work, “The Event,” is an intense evening of contemporary dance, short film, song and existentialism. Premiering at Georgetown’s Base: Experimental Arts + Space, “The Event” opens with a short film projected within a giant gilded frame on the back wall of the stage. The film is a study in stillness featuring two women lying chest-down on a table and blowing a wad of cotton back and forth. During an early October rehearsal viewing, the film played as four dancers sat or stood frozen onstage under dim light, dressed in painters’ smocks printed with sunsets and clouds. The film ended as somber ambient music by sound designer Paurl Walsh rose in volume, mixed with low mutterings from dancer Amelia Reeber as she spoke into a microphone tucked into the back wall of the stage. A heavy ennui hung over the four performers until they began to count to five and ring small gold bells at a frenetic pace. Through Oct. 22 at Base Experimental Arts + Space, 6520 5th Ave. S., #122, $18 (theeventpeggypiacenza.brownpapertickets.com). “The Event,” Piacenza’s first new work since her 2014 multi-media “Touch Me Here,” tackles heavy subject matter: the meaning of life, the inevitability of death, and how we experience everything in between. Development of “The Event” began with Piacenza’s viewing of a film by former 33 Fainting Spells collaborator Gaelen Hanson that helped her assign specific images and movements to the emotions she was experiencing during her mother’s terminal illness. The text portions of “The Event” also inspired Piacenza’s choreography. 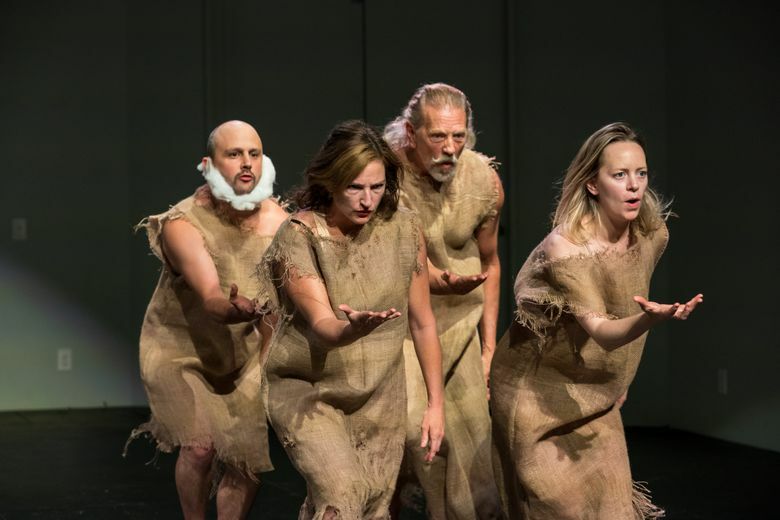 During the show, the dancers recite lines from Lars Von Trier’s film, “Antichrist,” that encourage the film’s protagonist to breathe through a period of intense grief. “Dancing helps me deal with anxiety and come back to my breath,” she said. “The Event” is Piacenza’s first production in the new Base: Experimental Arts + Space project that she co-founded with Dayna Hanson and Dave Proscia, located at Georgetown’s Equinox Studios — a giant industrial maze of art spaces made of old factories, warehouses, and cargo containers. Nestled in this newish center of Seattle artistic creation, “The Event” seems to be deeply affected by the entire Seattle dance community despite its intensely personal subject matter. The project was partly funded by an online fundraising campaign instead of commissioned by one of the bigger local dance organizations, and the cast includes some of Seattle’s most beloved and up-and-coming dance artists. In “The Event,” Wade Madsen, professor of dance at Cornish College of the Arts, and former Pat Graney dancer Amelia Reeber, dressed by costume designer Dani Blackwell in pale pink 1980s lounge wear, sing Leonard Nimoy’s “Cotton Candy” while dancers Kim Lusk and Ezra Dickinson perform awkward wriggles around them. Over the dancers, says Piacenza, will hang a giant installation of faux cotton candy by set designer Julia Welch. The absurdity of the scene is in stark contrast to another section of “The Event” where the dancers perform in burlap sacks as if wrapped for burial.